My first zine was called, “Puke Stories” and it detailed childhood mishaps involving getting sick. I was a very nervous child, and threw up every morning from Kindergarten through almost 4th grade. I made the zine in 1999, and though it was crudely drawn, I was happy to have gotten those stories out of me. My most recent zine is about a typical Midwestern summer vacation. I drew out my memories in colored pencil scenes. I remembered everything so vividly because we took the same vacation every year (or every other year) to Wisconsin Dells. I wanted to make a zine not about the funny details, but about the atmosphere – the hot heat, the hours driving past corn fields and flat land. I made a zine called “The Cheapest S.O.B’s” which chronicles some of the ridiculous lengths my grandparents go to save money and be cheap. It’s the zine that I have gotten the most response from, and one that me and my parents have enjoyed together, and also, it was recommended by the Multnomah Cty. Library [in Portland] as a zine to read to get good ideas on saving money in this economy (I hope they were kidding because my grandparents steal food from community gardens and take food home from cancer survivor picnics!) I have since made a prequel, and I intend to do a sequel now that my grandma died. 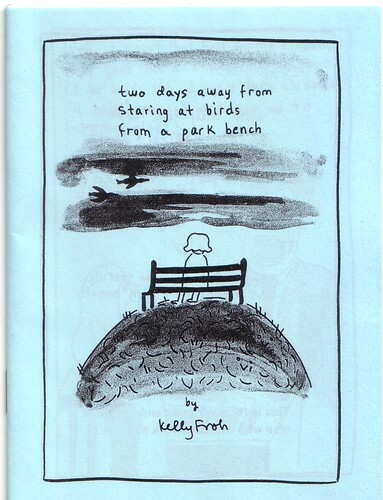 For more from Kelly Froh, check out her website. Kelly and Eroyn co-organize the Short Run small press fest in Seattle.